In view of the fact that your relatives continue their offensive against Soviet Russia, the Presidium of the Ural Regional Soviet has decided to sentence you to death. Lord, oh my God! Oh my God! What is this? I can't understand you. The bodies were disposed in a truck which Yurovsky ordered at midnight and taken to the forest to be disposed. The execution was covered up as a disappearance for a while. Soon after, the Bolsheviks announced that only Nicholas had been shot, but that the members of his family had been spirited away to another place. Most reports showed that they had all been executed by a detachment of Bolsheviks led by Yakov Yurovsky, a watchmaker from Perm. Other witnesses swore to have seen the Empress and her daughters in Perm. King Alfonso XIII of Spain negotiated with the new Soviet government interceding for the remaining members of the family that he thought alive. Then in 1989, Yakov Yurovsky's own report was published, which seemed to show conclusively what had happened that night. The execution took place as units of the Czechoslovak Legion, making their retreat out of Russia, approached Yekaterinburg. Fearing that the Legion would take the town and free him, the Emperor's Bolshevik jailers pursued the immediate liquidation of the Imperial Family, arguing that there was "no turning back." The telegram giving the order on behalf of the Supreme Soviet in Moscow was signed by Jacob Sverdlov, after whom the town was subsequently renamed. Nicholas was the first to die. He was executed with multiple bullets to the head and chest. The bodies of Nicholas and his family, after being soaked in acid and burned, were long believed to have been disposed of down a mineshaft at a site called the Four Brothers. Initially, this was true — they had indeed been disposed of there on the night of July 17. The following morning — when rumors spread in Yekaterinburg regarding the disposal site — Yurovsky removed the bodies and concealed them elsewhere. 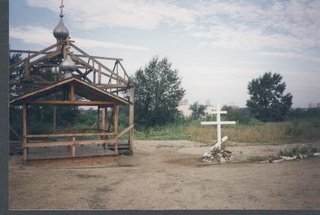 When the vehicle carrying the bodies broke down on the way to the next chosen site, Yurovsky made new arrangements, and buried most of the bodies in a sealed and concealed pit on Koptyaki Road, a cart track (now abandoned) 12 miles north of Yekaterinburg. Their remains were later found in 1991 and reburied by the Russian government following a state funeral. The process to identify the remains was exhaustive. Samples were sent to Britain and the United States for DNA testing. The tests concluded that five of the skeletons were members of one family and four were unrelated. Three of the five were determined to be the children of two parents. The mother was linked to the British royal family, as was Alexandra. The father was determined to be related to Grand Duke George Alexandrovich. British scientists said they were more than 98.5% sure that the remains were those of the Emperor, his family and their attendants. Relics from the Otsu Scandal (a failed assassination attempt on Tsesarevich Nicholas (future Nicholas II) in Japan) provided enough blood stains to make a negative identification possible. A ceremony of Christian Burial was held in 1998, and the bodies were laid to rest with State honors in a special chapel in the Peter and Paul Fortress in St. Petersburg.